I’m excited to present my first giveaway of the new year to you thanks to the sweeties at Jane Iredale. “I’ve always said makeup should be a part of the solution rather than a part of the problem. How spot-on is Miss Jane in this thought? While us beauty babes are minorly obsessed with makeup, skincare will always be my No. 1 concern because without a healthy complexion, no amount of makeup is going to look that great on your skin. That’s not say that you must have perfect, pimple-free skin to have a healthy complexion; does that skin even exist? It’s to say that you must treat your skin well first and then choose the healthy, clean makeup to layer atop it to enhance your glow. And that’s where Jane Iredale’s Starter Kit comes in. Jane Iredale’s new Starter Kit contains the essentials you need to enhance your natural glow, including Smooth Affair Facial Primer & Brightener, Amazing Base SPF 20 Loose Mineral Powder, PurePressed Base SPF 20 Mineral Foundation, POMMIST Hydration Spray, a mini powder brush and a travel-size cosmetic case with extra-large mirror. Primer is one of those things that’s a bit underrated when it comes to keeping your foundation smooth and in place all day. Smooth Affair Facial Primer & Brightener glides on easily and provides a great base for your foundation. Another step that I think is so important in achieving a luminous complexion is spritzing your face post-makeup application. Sometimes you can look a little too “done,” so misting on a hydrating spray, such as POMMIST, gives you a bit of dew and liveliness. POMMIST is a great little product to have for refreshing your makeup after lunch and at the end of the day before you head to happy hour. What’s in between — your loose or pressed minerals — is what gives you that even, healthy glow, and you’re definitely in good hands with both Amazing Base and PurePressed Base. I do tend to prefer a good pressed powder, but loose minerals give you that effortless look that sometimes hard to replicate. 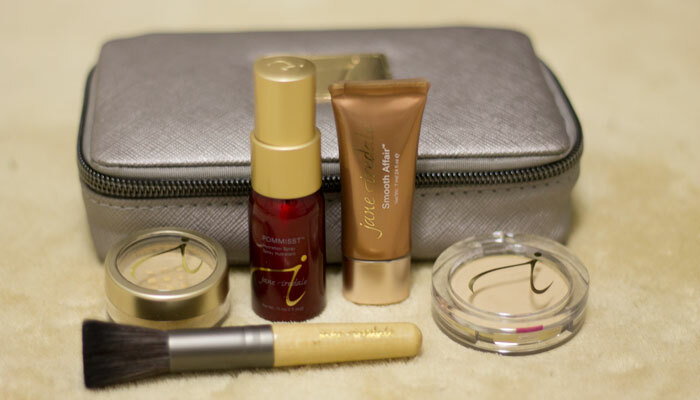 So are you ready to get your hands on this lovely little Starter Kit from Jane Iredale? To enter, use the handy-dandy Rafflecopter widget below. Good luck! Giveaway begins Friday, February 7, 2014, at 12:00 a.m. Central Time, and closes on Friday, February 14, 2014, at 12:00 a.m. Central Time. 3. Sweepstakes begins Friday, February 7, 2014, at 12:00 a.m. Central Time, and closes on Friday, February 14, 2014, at 12:00 a.m. Central Time.